The villa was really great. It was clean and the workers always available to hep you with a great smile. Thanks to Theodora, Wayan and the entire team that made our trip a wonderful one. The rooms were fully equipped such as the living space. The swimming pool and the pool table really pleased the entire families! Two small things could be improved: one expresso machine for coffee lovers. And it might be interesting to get two additional foldable sunbeds as there is only four available so when everyone wants to lie, there is not enough. Two foldable sunbeds that the team could place in case needed could be a great advantage. 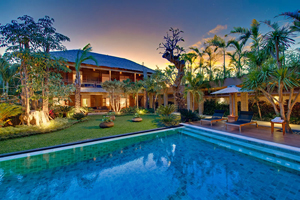 But really you can go in Villa Kinara and you will really appreciate your stay!